Tonight I'm going to a friend's house to watch Anne of Green Gables and work on crafty projects. I was thinking about what kind of snack I should take that would fit with the movie theme. 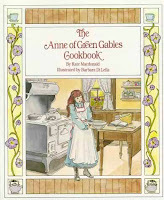 When we were on Prince Edward Island I found an Anne of Green Gables Cookbook but didn't buy it because it was a little on the spendy side. Today I remembered there was a recipe for Raspberry Cordial in that book. Tom googled around a bit for me and found this yummy recipe! Warm raspberries on the stove, adding sugar once it won't sift to the bottom and burn. Simmer on medium for about 30 minutes, until berries are mashed and sugar is dissolved. Pour the mixture through a sieve or fine strainer to extract juice. Discard seeds and pulp. Add lemon juice (equivalent to juice of 2 lemons). Boil 10 cups of water and mix in juice. Let cordial cool then transfer to refrigerator. 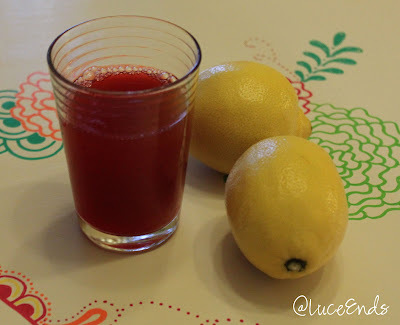 Slice lemon and add to juice when you serve it. I think it came out tasting pretty yummy! Thanks so much for making this, i LOVED it! you may be asked to bring it again when we watch anne of avonlea!! !